Study Bachelor of Clinical Exercise Physiology (Honours) at the University of South Australia (UniSA). Information for International students. Study South Australia’s only degree that will qualify you as an accredited exercise physiologist in four years. Study at the No.1 University in South Australia for graduate careers in Health Services1. Learn from a University that has well-above world standard research in Human Movement and Sport Science2. Provide services and learn in our on-campus High Performance Sport Centre and Exercise Physiology Clinics. Learn in our state-of-the-art on-campus exercise physiology, biomechanics and anatomy laboratories. Gain practical experience when you complete more than 600 clinical placement hours of work experience across a range of South Australia's best clinical exercise facilities. Get ahead of the crowd with a highly regarded honours degree. 1QILT: Graduate Outcomes Survey Course Experience Questionnaire 2016-18 – Overall Employment Indicator (Undergraduate). Public SA-founded universities only. This industry-relevant, practical degree will provide you with an in-depth understanding of how to use exercise management to prevent disease onset and treat a range of cardiovascular, respiratory, metabolic, neurologic and musculoskeletal conditions, as well as cancer. Practical experience will be further highlighted when you complete real-world clinical placements. These field placements are not only a practical way for you to apply what you have learnt during your studies, but are also a great way to build industry networks and relationships. A major part of your studies in third and fourth year will involve completing an honours level professional project related to clinical exercise physiology in partnership with an academic researcher or industry professional. You will also be exposed to research and learning opportunities in our on-campus and community Allied Health and dedicated Exercise Physiology Clinics. Through a variety of theoretical classes, practical experiences and clinical placements you will develop an understanding of how exercise management can be used to prevent disease onset and to treat a range of diverse health conditions. These include, cardiovascular, respiratory, metabolic, neurologic and musculoskeletal conditions, as well as cancer. 2. Students will be required to satisfy the standard of dress, behaviour and fitness prescribed by institutions in which the professional or clinical placements are undertaken. Failure to satisfy such requirements may prevent them satisfying the requirements for the completion of the program. 3. Students are required to have a current 'Provide First Aid' Certificate (or equivalent) prior to the commencement of their first placement. Students will need to cover costs associated with this certification. 4. Students will be required to undertake Child Safe Environments training before commencing their first placement. Students will need to cover costs associated with this training. 5. The program requires participation in practical classes where manual skills are practiced. Essential learning activities in some classes may require that students partially remove their clothing to a level that is appropriate to the learning activity. Students may also be asked to act as subjects for their peer group members. If a student is unable to meet these requirements they may be at risk of being unable to successfully complete course objectives and assessments and progress through the program. 6. Participation is required in practical classes and clinical placements where students are required to physically handle people including lifting and supporting people with disabilities. 7. Students will be required to undergo pre-exercise screening with the School of Health Sciences prior to commencing the degree to ensure safe readiness to participate in physical activity or exercise related learning activities. 8. Students must meet the vaccination requirements for health professionals prior to commencing the program. Failure to meet vaccination requirements will limit placement opportunities. 1. Students may be required to undergo a medical examination before commencing clinical placements as determined by the relevant hospital or placement authorities. 2. Students are advised that they may be required to spend time in a placement outside Adelaide in a country or interstate location. 3. Students may be required to undertake placement outside normal university teaching weeks and outside of normal business hours. 4. Students are advised that a current South Australian driver's license may be required by some field practice agencies and a driver's license is considered an advantage for field practice opportunities. 5. One elective must be chosen from the Program's elective list or from other courses negotiated with the Program Director. 6. One elective may be chosen from outside the Division of Health Sciences. 7. Year 4 of the program commences early in the First Semester. The total load for the year is 36 units, however the project and thesis are completed throughout the year, thus balancing student workload. Over the third and fourth years of your degree you will complete an honours level professional project related to clinical exercise physiology in partnership with an academic researcher or industry professional. You will receive First Class, Second Class or Third Class Honours, depending on your performance. Your honours degree will prepare you well for a career in industry or research. Graduating with an honours degree will set you apart from the crowd, ensuring you have a competitive edge and are well-placed for a career in industry, research or further postgraduate study. This unique degree also equips you with the educational requirements to practice as an Accredited Exercise Physiologist, and an Accredited Exercise Scientist in Australia. 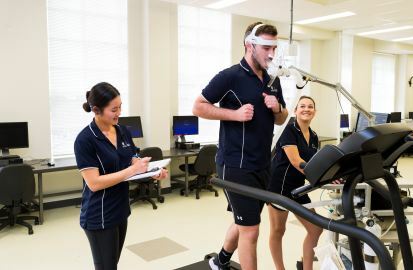 UniSA has invested an impressive $2 million in on-campus facilities over the past six years, and as an exercise physiology student you will reap the rewards. You will gain practical skills in our Allied Health and Exercise Physiology Clinics, which provide support and laboratory monitoring for people with chronic conditions and exercise therapies for rehabilitation, providing you with valuable learning resources. Our newly refurbished exercise physiology laboratories are also a practical learning space where you will conduct various tests using equipment such as treadmills, bikes and an underwater weighing tank. The biomechanics laboratory is another space that offers the opportunity for you to be involved in biomechanical assessment research. Our UniSA Sport Gyms aren't just a place for you to work out, they act as an integrated teaching and resource facility where you can undertake physical activity measurement research. You will benefit from our strong industry links when you complete clinical placements across a range of South Australia's best clinical exercise facilities. You will complete more than 600 hours of clinical placements, where you will be given opportunities to develop industry relationships that will become part of your future business network. As recognised allied health professionals, accredited exercise physiologists are qualified in clinical exercise prescription and the delivery of exercise-based lifestyle and behaviour modification programs to prevent and treat injury and disease. You should have a strong interest in the principles of exercise and physical activity, be interested in treating and managing injuries and illnesses with exercise, and have a genuine ambition to help the sick and injured lead healthier lives. Strong communication skills, including the ability to interact with people of all ages and backgrounds as well as other health professionals, are essential. 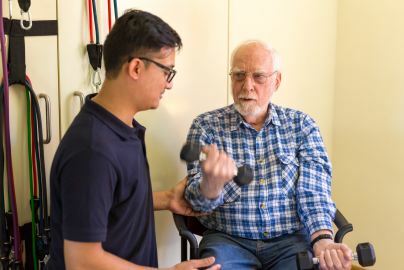 Career prospects nationally in the area of exercise physiology is expected to continue growing1 due to our ageing population and an increased awareness regarding the benefits of exercise for a range of health conditions. This could also lead you to work in areas such as workplace health and wellness, aged care, primary care and high performance. 1Australian Government Department of Employment, Occupational Employment Projections 2015. The program is accredited by Exercise and Sports Science Australia for graduates to be eligible to apply to be recognised as Accredited Exercise Physiologists and Accredited Exercise Scientists. Employment as a occupational and envrionmental health professional in Australia is projected to increase by 3,400 (or 14.3 per cent) by November 20201. Employment as a health therapy professional in Australia is projected to increase by 21,600 (or 25.2 per cent) by November 20201. Employment as a welfare, recreation and community arts worker in Australia is projected to increase by 4,000 (or 15.9 per cent) by November 20201. I am an accredited clinical exercise physiologist in private practice, hospitals, GP super clinics and university health practices – I have a passion for the exercise physiology and how this can influence human function and health. I enjoyed Biology and PE in high school and chose this degree because it involved both the sports and clinical side of science. As part of my studies, I get the opportunity to run exercise classes, develop exercise programs and talk to different clients. I always had an interest in health and exercise so this degree was perfect for me. I get to improve the health of others through exercise whilst sharing my passion with them – it’s very rewarding. I chose to study a Bachelor of Clinical Exercise Physiology because my family is affected by obesity, type 2 diabetes, hypertension and heart disease. As a Muay Thai Boxing champion I am aware of how important exercise is to maintaining good health. Following graduation I hope to use my knowledge to influence positive health outcomes within the community and tackle the world’s obesity crisis.